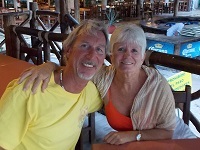 Progreso Mexico in my opinion is a well kept secret. It is a destination where you can go to relax and live amongst neighbors and not be seen as an intruder or a tourist. 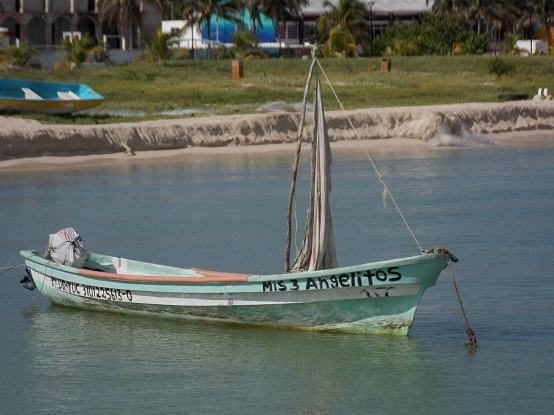 Progreso is a vital port for the state of the Yucatan. But it’s roots as a traditional fishing village date back for many centuries. It lies approximately thirty minutes north west of Merida, which is where the Governors Palace is located. 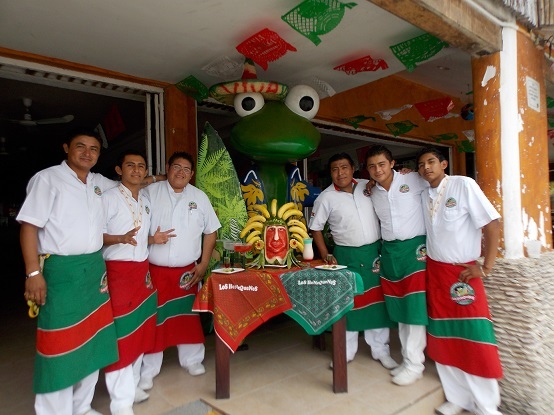 Progreso’s roots are inherent to being a close net community filled with family commitment. Their values have not changed throughout many generations. 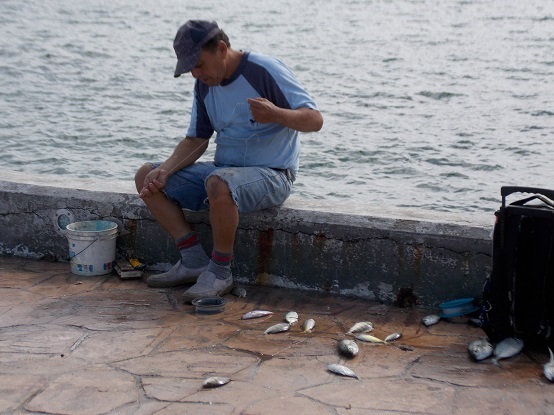 I spent my first morning visiting the fishing dock that parallels Progreso’s famous Puerto de Progreso. I got the opportunity to throw a line in with one of the local fisherman. Federico and I had to communicate in broken dialogs and lots of hand signal. 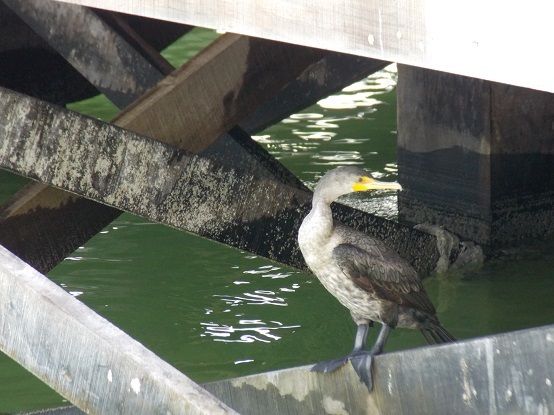 But by the end of the morning, I had made a new fishing buddy. 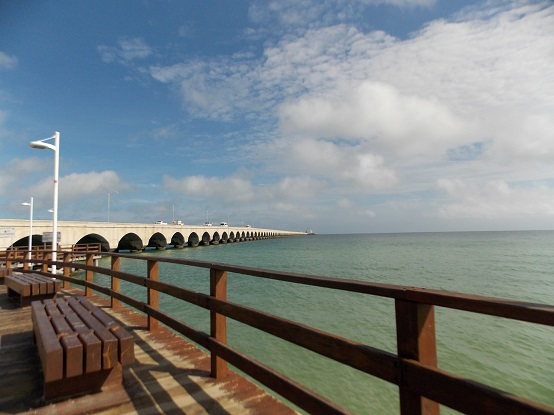 Progreso is home to one of the longest piers in the western hemisphere and argumentatively in the world. It is rumored that the pier extends out into the Gulf waters at over four plus miles and that doesn’t include the jetty that spurs off from its tip. 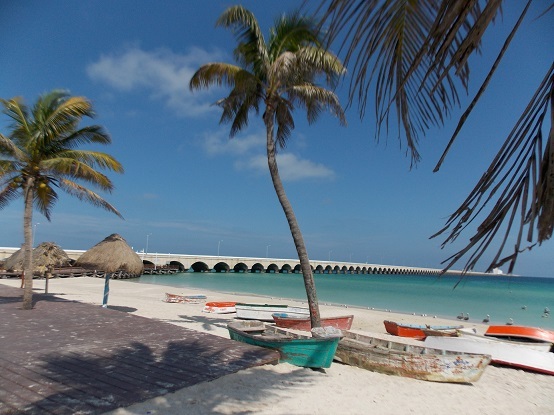 The pier serves as a major sea port for the Yucatan state and surrounding regions. The fishing pier that sets along side it seems like the younger sibling to the rival big brother. 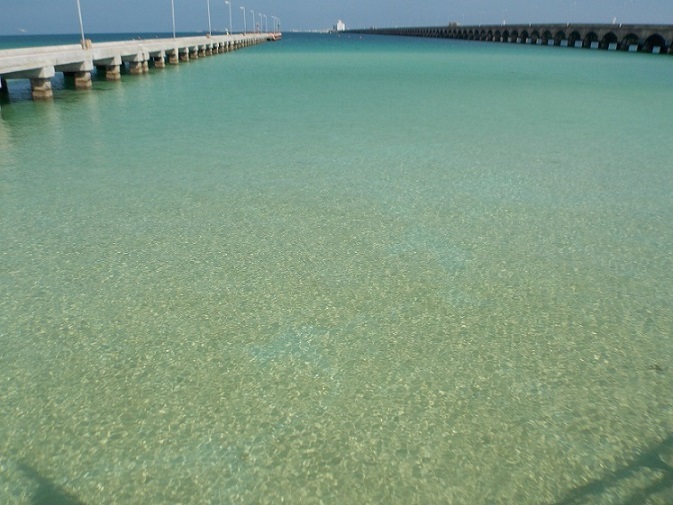 The vast waters in this part of the Yucatan Peninsula are very clear in nature. 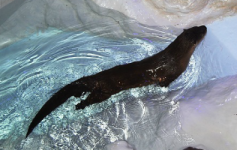 They offer calming waves that are perfect for wading, swimming or just goofing around in. The aquatic life that can be seen in the transparent waters swims wildly around you with obvious curiosity. 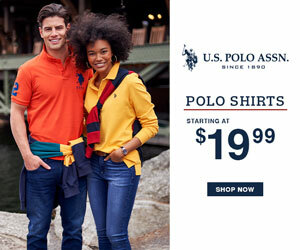 The temperature stays within one or two degrees of an average 86 Fahrenheit . 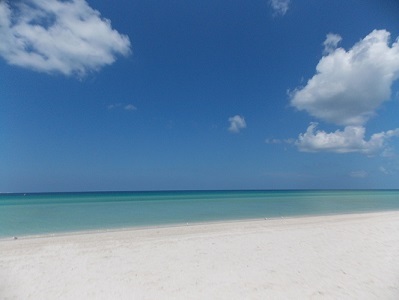 The beach’s sugar white fine granules that mimic an hour glass’s sand run along the turquoise shores as far as the eyes can see. The horizon never seems to end until the sunset mysteriously disappears behind it. The soft sand massages your toes like a bunch of tiny fingers rubbing up and down the palm of your feet. A stroll down the beach can be so relaxing, a kind of soul searching mission. There are plenty of places to stop and enjoy a bite to eat or a refreshing beverage, or both. 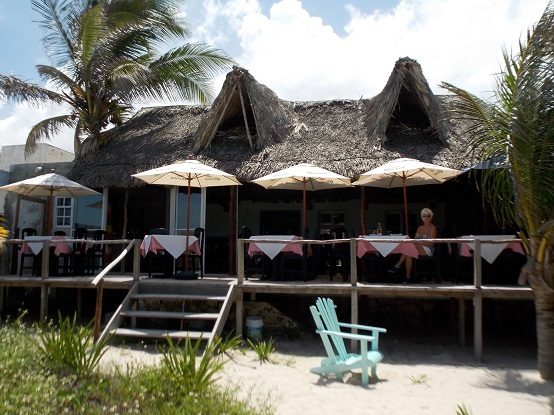 The palapas and grass tiki huts are in abundance up and down the beautiful turquoise Gulf Sea. Just off the beach is the Malecon. This is the street that runs along the town’s scenic shoreline. 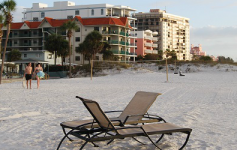 It is lined with restaurants, shops and water view rental accommodations. It offers daily and nightly activities. Almost every evening families, couples and plenty of individuals come out and walk the Malecon. 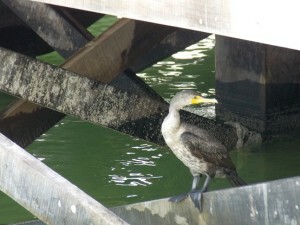 They enjoy the cooling breezes and the sounds of the gentle waves slapping against the sandy shore. Various vendors offer their crafts and specialty foods that are freshly prepared right in front of you. 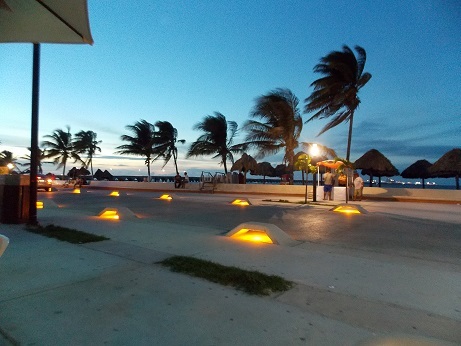 The beachfront thoroughfare lights up after sunset with its modern motif street level fixtures. There is live curbside entertainment, dance and zumba in the Malecon’s beachside park and lots of other family oriented events. All this follows watching the sunset over the beautiful Gulf of Mexico’s endless horizon. 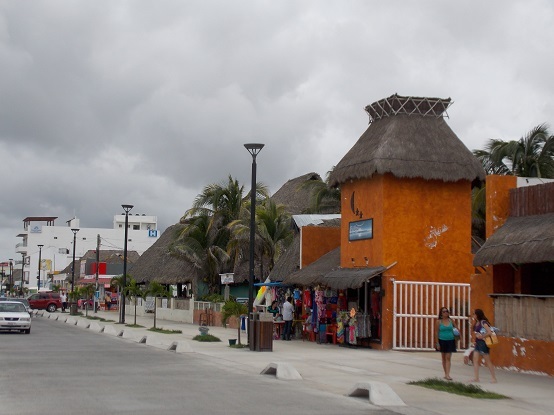 The streets leading into the town of Progreso are as festive as their beach lined counter parts. 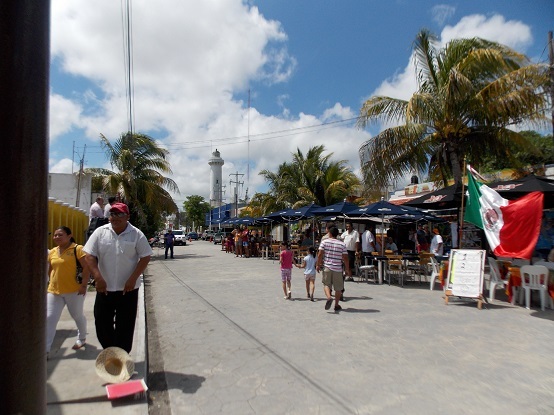 On the weekends when the cruiseship makes port, several of the streets leading to the Malecon are blocked off. The store fronts set up sidewalk dining areas, open air markets and vendor carts that offer their goods and services to everyone. It becomes a “Fiesta en la Calle Mexico” (Mexico Street Party). Have you noticed the lighthouse in the distances shown in the photo above? Progreso’s Lighthouse (el faro) stands at approximately 120 feet. It was constructed from 1885 to 1891. We stayed in Progreso through the month of September, which just happens to be the month that Mexico celebrates its independence. The celebration starts early in morning of the 16th and goes into the wee hours of the night. We enjoyed the festivities right along with the locals. We stopped to have lunch at one of the popular cantinas. 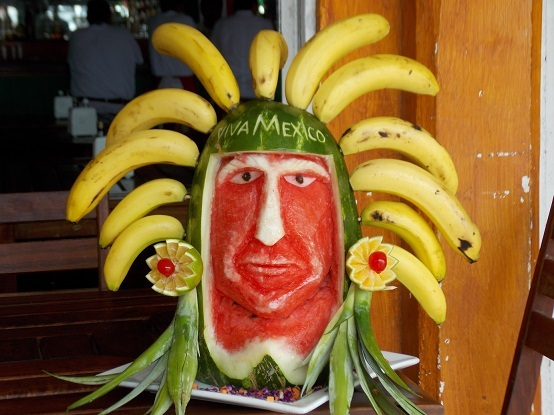 We got the opportunity to witness the unveiling of the chef’s carved fruit layered designer dish shown above. 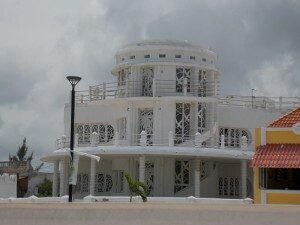 The people here are proud of their independence and love to share their celebration with their visiting guest and expats who claim Progreso as home. There are some hidden jewels for eateries up and down Progreso’s beaches. Elio Restorante is one of them that we happen to stubble upon. The food was prepared from the freshest ingredients. It was cooked to perfection with the area’s traditional manner in mind. The service was spot on and they catered to our every need. 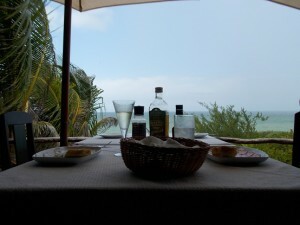 This is not to mention the views from the open air deck with our white linen covered table. The beachside ambience includes a light ocean breeze and swaying palms above. The moment can be breath taking and invites romance in its perfect setting. 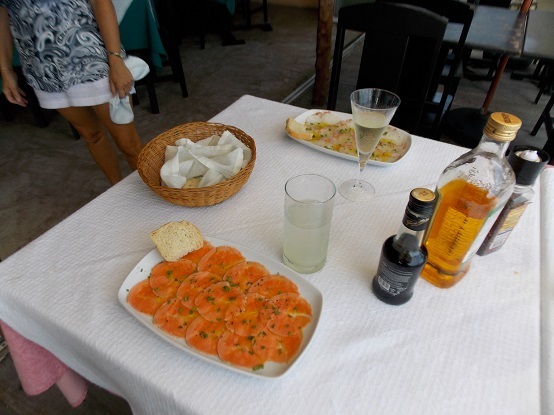 There are plenty of restaurants and bar & grills to choose from. Most, if not all of them are home grown. Cooperate brands have yet to invade this surfside paradise. 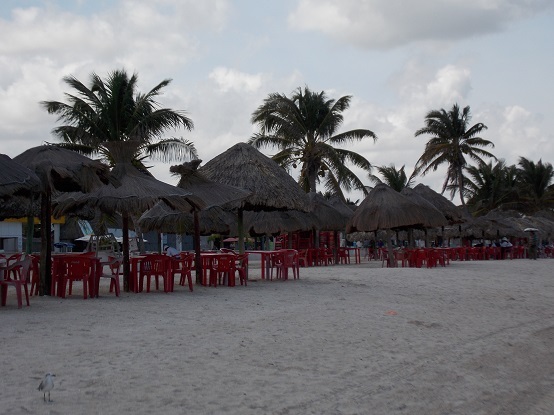 Our month long stay in Progreso was a relaxing one that offered us another look at not just being a tourist on vacation. We took time to know the people and some of the daily rituals. Their rare creativity is explained in the photograph shown left. A hand painted namesake on the bow, the twine that steadies the branch that makes for its tattered sail. 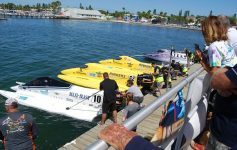 The outboard motor is used when there is enough money to buy fuel or find parts to repair it. We enjoyed the creative architecture, the unspoiled wildlife that surrounded us and the many sunsets that blessed our eyes with subtle, but engaging colors. 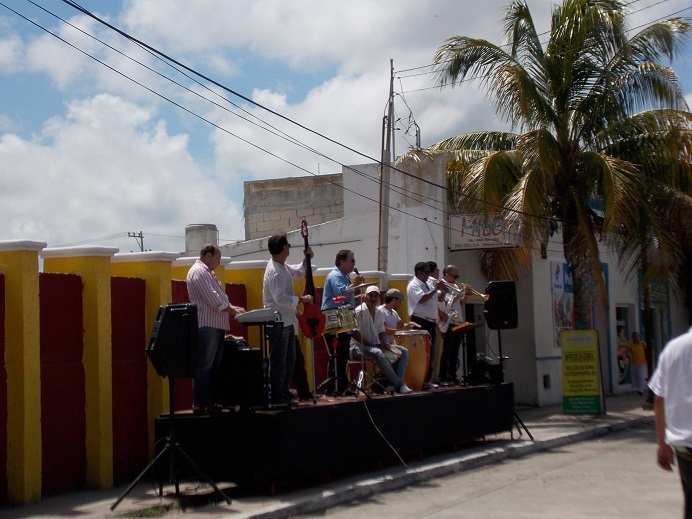 The residents of Progreso excepted us as part of their community. They waved to us, shook our hands, smiled at us, got to know our names and laughed when we were enjoying their beautiful town. When your travels take you to places for a week, a month or longer, get to know the community you are part of. You will establish relationships that will bestow memories within people who you will probably never see again. But what you will leave with them is a positive outlook at a world that many of them know nothing about.